Have you got obsessed with something overnight? You think about it all the time and you talk about it to others during your conversation. The enthusiasm that you have while talking about your obsession lure people to try to do what you do. Crazy, Stupid, Awesome, Kewl, Interesting, Exciting are some of the words people tag you with. You care less what others say because what you are doing matters the most to YOU. I have been bitten by the running bug and I am just obsessed about running ever since. Of course the series of events that I am going through also plays a major factor in keeping me running. I am new to this sport. I have never run more than 2km ever in my life until last month. I do go on crazy hiking every weekend to the remote forests and I have spent my times in the wild. I have walked 40km in two days with a heavy backpack under hot sun for long hours without water in the toughest terrain. But when it comes to running, No! I can never. I don’t know why I got obsessed about running. But there is something to it. I like it for its SIMPLICITY. Get up and lace up your shoes and RUN. That’s all, just three quick steps with first one being the most difficult to do. I read and watched several stories of marathoners and ultra marathoners and it just amaze me. People choose to run ultra-marathons like Badwater, Jungle Marathon, Western States 100 etc putting themselves in inhumane conditions enduring pain and torture and above all they love it. Why? Some say the pain makes them feel that they are LIVE. Some say it’s about finding your true self. Some run for a cause. Some run to forget a pain that they endured. I am yet to find out why I have chosen to Run, but as for now I RUN and I am loving it. I am feeling like Forest Gump! (That's the reason I chose the name for this blog). When I first decided to do my 5K run along with like minded friends three weeks back, I thought it will just be a piece of cake considering my hiking experience. I was wrong. After running for 1.8Km I was gasping for breath like a dead man and my foot wouldn’t move an inch. It was pain and soreness everywhere. That’s just for 1.8km and my target is to run a marathon, that’s 42.195 km. I was laughing at myself, but I was determined to RUN. Runners World , Running Times is where I started hanging out for most of the times. 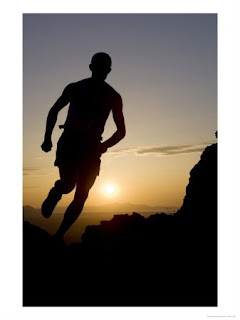 I created a profile for myself in MapMyRun to keep a track of my weekly mileage. Pasta, Gatorade and Mountain Dew has become my food and drink. The following days, I tightened my shoe lace and began my run again. Pain, soreness, injuries started surfacing, but I never quit. But I could see a visible change happening within. My heart beat is more systematic, my breathing pattern has got a rhythm, my posture while running has changed and I no more gasp for breath like a dying man. After two weeks of running, every alternate day, I am amazed to see myself running about 15kms in 1Hr and 15 min. Above all I could see a change in my attitude. The way I approach and look at things. My day starts so fresh. I am sure there’s more in store for me in this journey called Running and I am excited about the lessons that it’s going to teach me. Let me tell you. Run!! It’s just amazing. You’ll find it for yourself. It’s painful but it is fun. I have a goal, to run the Hyderabad marathon. I have sufficient time at hand to train myself, to cross the finishing line, to run for a cause where every mile counts. Ultra Marathon is my aim but I would like to take one step at a time. I’ll post my experiences, to keep myself accountable for my commitments. With my running shoes and a free road to run, I got everything I need. To RUN! You are my inspiration! Running makes me feel fresh too...the most successful way to vent out negativity from the body. You are one awesome flying monkey!